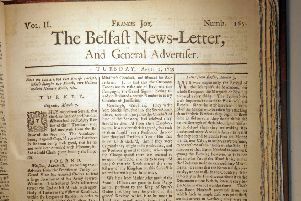 On Sunday last was brought Prisoner here from Lisburn, and Yesterday committed to his Majesty’s Goal at Carrickfergus, by a Mittimus from Edward Smyth Esq; one James Longmore a Traveller; a middling siz’d Man, about thirty six Years of Age, of a dark Complection, wears a light Drab big Coat, a dark Wig, says he came from Ardmagh and is by Trade a Weaver. He being suspected to be a Rogue, was taken into Custody and examined; who, not giving good Account of himself, was search’d, when several bad Half Crowns, Shillings, together with Instruments, Dies, Stamps, &c, for Coining the same were found in his Custody. We have Advice from Antrim, that on Saturday last, the Right Honourable the Lord Viscount MASSEREENE and his new married Lady arrived in perfect good Health at their Seat there, to the great Joy of the whole Country in general, and that noble Family in particular. His Lordship was met, some Miles off Antrim, by a considerable Number of Gentlemen, and several hundred of his Lordship’s Tenants, well mounted, who assembled there to wellcome him on that Occasion, and accompanied him into Town, where his Lordship and his Lady were received with loud Acclamations; and the Evening concluded with Bonefires, Illuminations and other Demonstrations of Joy. Since my last arrived the Providence of Aberdowey in Wales, Thomas Godfrey, from Bristol, with Glass Bottles, Leaf and Roll Tobacco — The John of Waterford, William Connell, with American Flaxseed — The Two Sisters, Simon Sweal, from Portaferry, with Barley — The John of Lairn, John Moor, from Dublin with Flax-Seed and other Merchandize — The John and Elizsbeth, Sloop of Dublin, John Reid from Dublin, with Iron Pots and Oak Plank. We accept the honest Fellow’s Thanks as heartily as he offers them: And assure him, that whatever we can do in his Business, we shall attempt it with Pleasure. Our Invitations to all Gentlemen to join their Endeavours to our own, for the Improvement of this our common Country, have not been wanting hitherto; nor shall they at any Time hereafter: Neither shall we forget to put them in Mind of the plain useful Lesson of our honest Correspondent, To do as well as say: To set an Example to their Tenants: Which, as he very well observes, is a very great Encouragement to poor People. 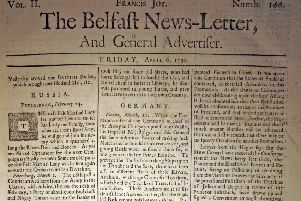 ‘Tis not easy to determine, Whether it is from Waggishness, or Ignorance, that he concludes, there are none of our Dublin Society in his Neighbourhood, because he is still oblig’d to go on in the old Way, for want of some to shew him better. Certain it is however, that it ought to be the distinguishing Character of every Member, to promote improvements to his Power: And that it must appear to every one, as well as our honesty Correspondent, a notorious Inconsistency, to say a great deal and do nothing; to point out new Ways to others, and tread the old Tract ourselves. We could wish to direct our Correspondent to some Place in Ireland, where there were Ponds and Mills and Ovens, that his Son Will might have the Farm, and his likely Lad be properly instructed in Flax-Dressing. Unhappily we cannot, and except Gentlemen will at last exert themselves, ‘tis too much to be fear’d, that but little will be done, of the Good this honest Man expects. Something possibly there may which his Children’s Children may bless us for in Time, but without greater Spirit and more Readiness nothing certainly that will affect the present Generation, and deserve the good Man’s Blessing while he lives. Alexander McAullay, Esq; hath declared himself a Candidate to represent our University in Parliament, in the room of Dr. Coghill, deceas’d. We hear that Robert Oliver, Esq; Member of Parliament for Kilmallock, died at Bath, a few Days ago. This Week the Hon. Henry Hamilton, Esq; Uncle to the present Lord Boyne, was made Collector of Cork, in the Room of Hugh Dickson, Esq; deceas’d. They advise from Constantinople, that the Turks are at present more zealous in their Worship than has been known for many Years, their Mosques being daily crowded with Mussulmen, to extort from Heaven a Victory over the Christians; and of the Prayers for that purpose, among the rest is one of the following Tenor — Almighty God, grant the Armies of the Believers may triumph over their Enemies; that the unbelieving Russians and Germans may acknowledge thy Righteousness, and with shedding of their Blood confess the Justice of our Cause. We learn from Kilmarnock, That on the 15th inst. a Fire broke out (by the Negligence of a Servant) in the upper Story of the Castle of Dean, the ancient Seat of the Earl of Kimarnock, which burtn down the whole House and Furniture; so that scarce any thing was saved, except the Charter-chest. A valuable Collection of Books and Manuscripts were also consumed.